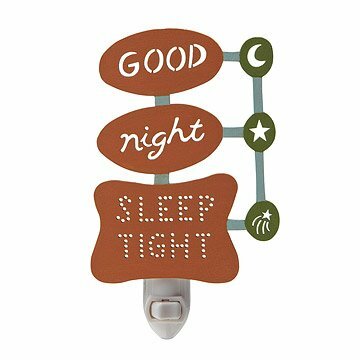 Inspired by mid-century motel signs, this sweet night light is cut from wood and hand painted. As a child, hearing a wish of "good night, sleep tight," was a sure sign that you had reached home sweet home. Now you can bring back some of that nostalgic glow into your own home. Inspired by mid-century design and the era of the great American road trip, this dreamy night light is designed to look like one of the one of the distinctive hotel signs that once dotted the highways. But while vintage-inspired, this particular marquis is newly made by Jasmine Redfern, who creates it from precision-cut birch plywood painted in vibrant colors. It is mounted on a switch-operated night light fixture, and the cut-out letters of the sign seem to glow like neon when lit. Handmade in New Paltz, New York. The Retro Good Night, Sleep Tight nightlight is wonderful in our upstairs bathroom. It gives off plenty of light while illuminating a really cool, unique design. The colors go well in our bathroom too- a light terracotta, mossy green and light blue. I think overnight guests will really appreciate this light when they sleep over. Not only does it light up the bathroom, it also spills light into the hallway, so when folks get up in the middle of the night, they'll easily be able to see whey're they are going. It is larger in comparison to other night lights and it is kinds delicate and I could see it being broken, but hopefully since we put the light in our bathroom in an outlet above the counter, it should be out of the way enough to avoid being hit. I purchased this for my guest bedroom. The nightlight looked red on my computer. It's not red, it's very orange. The description doesn't describe colors and it's my fault for not verifying. No worries, I will paint it! Looks amazing in my bathroom! In love with this night light! It is adorable and retro and perfect.